In an interview to Restaurant India, Gayatri Iyer, Founder and Chief Curator- Chef In A Box shares the idea of tying up with chefs and restaurants for curated recipes. Gayatri Iyer was in a plush corporate job, surrounded by the fancies which a corporate has to offer. She left behind all the comfort and gets an idea to be creative with food. One lazy Sunday, she was browsing her twitter feed and came across the concept of a US based platform called Homechef.com which sells recipe kits. Their product offering, processes and website really impressed me and it was then she thought why can't this be done in India? Here is where the creativity sprang up, a twist in this idea of not having your own kitchen but relying on the Chef and restaurant's kitchen and expertise. And, that’s how the birth of Chef In A Box took place. Why did you launch an online food ordering startup only when there are many other hot segments as well attracting VC money? This is not strictly a food ordering start up. Chef In A Box is focused on helping people re-create Chef style dishes right at home with the help of the Professional Chefs themselves. People get recipe kits that include all the measured ingredients and clear steps of instructions. The best part is that it comes directly from a Chef/restaurant's kitchen to ensure authenticity. This is a new concept in Delhi/NCR and we want to change the way people look at food and break the monotony of eating cooked food. People do love to cook and we want to give them a seamless experience in doing so by giving them everything they need. It is a fun concept and I am confident that it would catch up and people would take notice, not just the VC's. What made you enter into the Homechefs segments and how many chefs are there on board today? As I said, this is not a Home Chef segment that we have entered. This is a niche sub-segment of the food and beverage segment that we have entered. Currently we have 10 Chefs, Bakers and restaurants on board giving more than 30 recipes across Delhi/NCR. Yes, we do not have an app and that is intentional because we want to spread the word about our concept and want people to try it out, give us feedback and make our product stronger before investing in an App. Our online website ordering process is very simple for that purpose. But our future plans do involve creating an App as well, but that is after a few months, since we are only 2 months into our operations. Is there any funding round. Who is the investor? Future plans are always exciting and this is something that keeps you going even on the lousiest days. For Chef In A Box, we definitely want to continue to increase our Chef/restaurant base, which in turn would increase our recipe offerings, adding more exotic cuisines, dishes, categories. 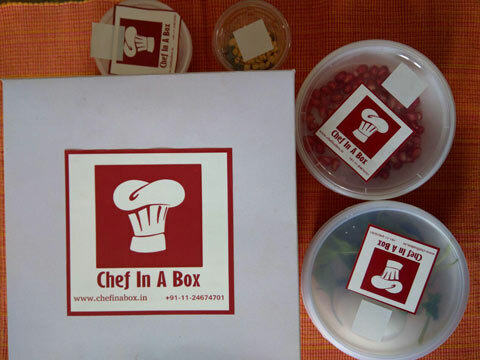 Expansion of this concept covering the entire Delhi/NCR and even other cities has always been a long term goal for Chef In A Box starting from day 1.We are also collecting feedback on the entire customer experience right from visiting the website till they cook the dishes. Each model has its own pros and cons, so it all depends on the vision and product idea you have. A restaurant as we all know is a very capital intensive industry and profitability is a challenge, hence to supplement the revenues one needs an online ordering service as well, to sell as much as one can. The online chef market place has its advantages of less capital intensiveness like real estate, manpower, utilities etc but technology and back end operations have to be very solid to support the product. So, in a case like my Chef In A Box, our main investment is the technology and back end operations like delivery etc. This model is definitely scalable depending on the customer response and need. There are similar start-ups in the segment. Any significant and substantial edge your start-up has over them? This is a very niche segment that we are entering into and it is not an everyday eating or cooking concept. The edge and USP is that all our recipe kits and ingredients come directly from the Chef's kitchen, i.e. the Chef's do the shopping for you (literally!) and give you the best ingredients to work with. We are the pioneers in this space. So, we are like a food panda/tiny owl for recipe kits. There is tremendous potential in this concept and we are very keenly interested to see where this wave takes us. "We work with partners who are always aligned..